We will be confirming times and dates for Fitzrovia Festival 2015 events over the next few weeks. If you use social media you can follow us on Facebook, Twitter, Google+, or if you prefer you can sign up to the Fitzrovia News email newsletter which is a weekly email of news and events in Fitzrovia. 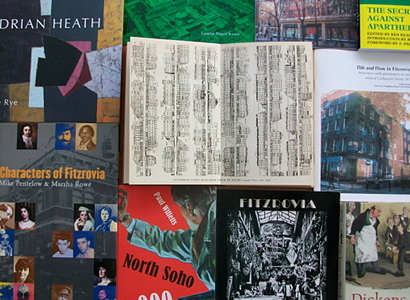 Fitzrovia Festival is a non-commercial celebration of the neighbourhood’s life and history through literature, exhibitions, guided walks and other community events. 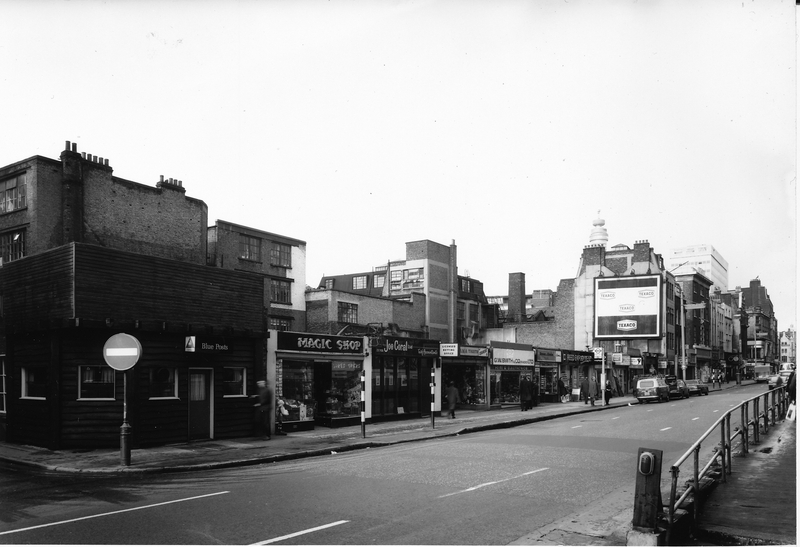 The “shacks” along Tottenham Court Road north of Hanway Street. 10am to 5pm Saturday 28 June 2014, Fitzrovia Neighbourhood Centre, 39 Tottenham Street, London W1T 4RX. These are the ideas for Festival during week of 23-29 June. (NB: Other events are also being put on by other organisations including London Festival of Architecture events at Store Street on Saturday 28 June, and a Fitzrovia Music Festival tbc; and possibly a commercial event). We will soon have news about events in June 2014. There will be an exhibition, a book fair and guided walks taking place between 23 and 29 June 2014. We’ll also have news about other events taking place in Fitzrovia. You can follow Fitzrovia Festival on Twitter and Facebook. Mike Pentelow editor of Fitzrovia News answers questions about the neighbourhood. 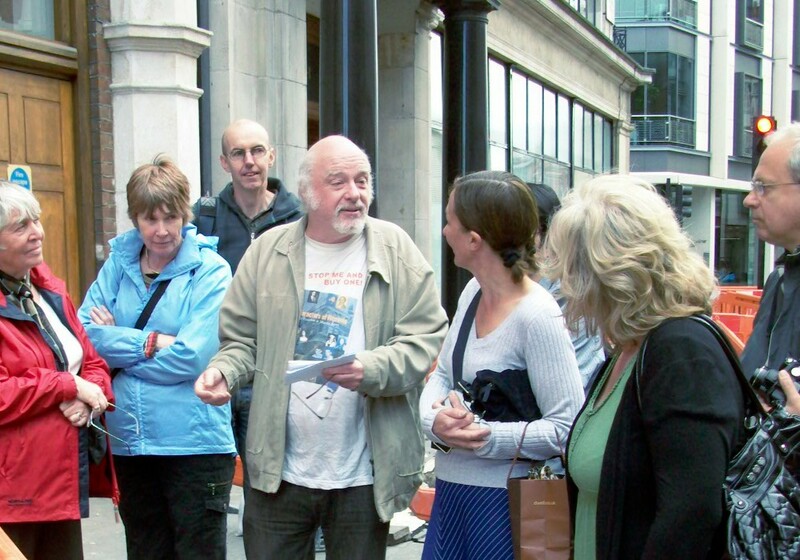 Find out about the stories behind the headlines on our guided walk of Fitzrovia. 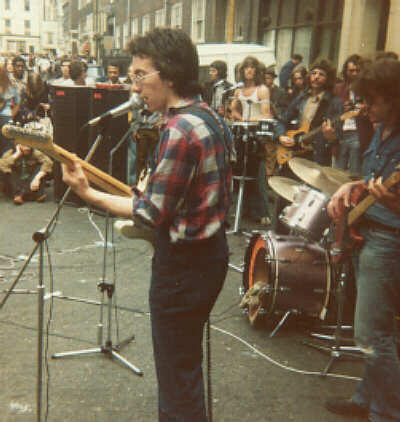 Elvis Costello (Declan P MacManus) playing with Flip City at Fitzrovia Festival 1974. Picture taken looking south along Rathbone Street. Singer-songwriter Elvis Costello was recently the subject of a BBC Four documentary. Having recorded 33 albums and had many hit songs he is widely regarded as one of the most versatile and intelligent performers of his generation. Costello played one of his first gigs leading the band Flip City at the Fitzrovia Festival Saturday 1 June 1974. We celebrated 40 years since the first Fitzrovia Festival in 1973 with a number of events in June and September. Fitzrovia Festival 2013 took place from Saturday 22 June to Wednesday 26 June 2013, and from Wednesday 18 September to 21 September, organised by the Fitzrovia Neighbourhood Association. Fitzrovia Festival 2013 was sponsored by LDG estate agents, 39 Foley Street, London W1W 7TP.